HSU ALERT TEST 3/26 11:50 AM / Are you registered yet? If you haven't already registered your cell phone to receive emergency text messages, please log in to myHumboldt My Profile page or learn more at: www.humboldt.edu/hsualert and register for this important service. Although HSU uses a multimodal approach to alerting the campus community in an emergency, studies have shown that text messaging can reach more people the fastest. HSU recommends that all current students and employees register for this service. On Wednesday, March 26th at 11:50 am, the campus will test HSU Alert Emergency Notification System. HSU Alert will send text messages to people who have registered their cell phone number in myHumboldt Emergency Text Message Number contacts. 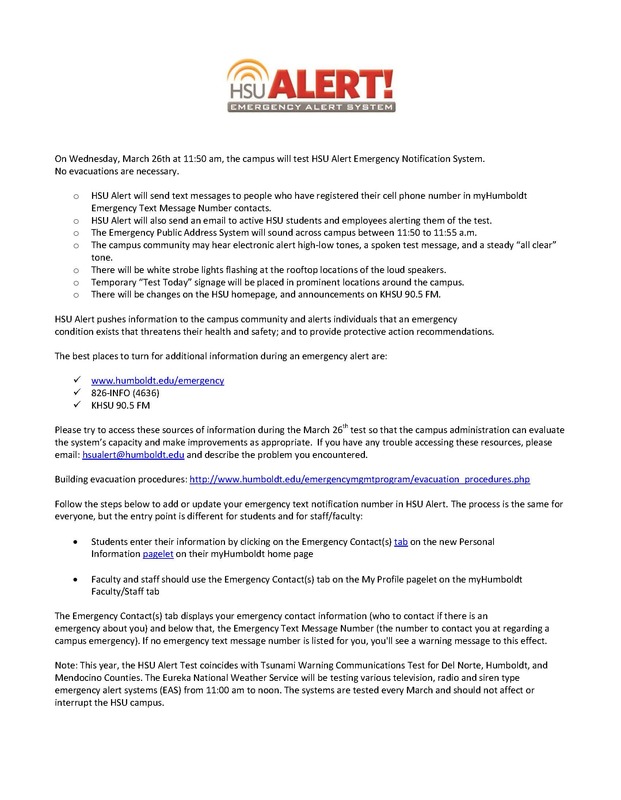 HSU Alert will also send an email to active HSU students and employees alerting them of the test. The Emergency Public Address System will sound across campus between 11:50 to 11:55 a.m. The campus community may hear electronic alert high-low tones, a spoken test message, and a steady “all clear” tone. There will be white strobe lights flashing at the rooftop locations of the loud speakers. Temporary “Test Today” signage will be placed in prominent locations around the campus. There will be changes on the HSU homepage, and announcements on KHSU 90.5 FM. HSU Alert pushes information to the campus community and alerts individuals that an emergency condition exists that threatens their health and safety; and to provide protective action recommendations. Please try to access these sources of information during the March 26th test so that the campus administration can evaluate the system’s capacity and make improvements as appropriate. If you have any trouble accessing these resources, please email: hsualert@humboldt.edu and describe the problem you encountered. The Emergency Contact(s) tab displays your emergency contact information (who to contact if there is an emergency about you) and below that, the Emergency Text Message Number (the number to contact you at regarding a campus emergency). If no emergency text message number is listed for you, you'll see a warning message to this effect. Note: This year, the HSU Alert Test coincides with Tsunami Warning Communications Test for Del Norte, Humboldt, and Mendocino Counties. The Eureka National Weather Service will be testing various television, radio and siren type emergency alert systems (EAS) from 11:00 am to noon. The systems are tested every March and should not affect or interrupt the HSU campus.